Canon seem to be into a period of product renewal, which goes less for the revolutionary and headline grabbing and more for making handling and overall usefulness better. While this is to be applauded the £3000 asking price for the body only, seems to me to take away much of the appeal that the 5D MkII had, being an incredibly well specified camera for a reasonable price. I guess in time it will come down but it does strike me as somewhat expensive and unless people are specifically in need of the improved specifications, is there much reason to upgrade? In the light of Nikons 36MP D800 which is cheaper, is this a good move? Having seen that the 5D MkII was used by professionals, it seems that Canon have positioned the MkIII for this professional and aspiring professional market and have priced it accordingly. I guess they will sell them, but it seems to me that there is a reaction to the current changes in the market, with DSLR's being challenged by the advanced CSC's for the mainstream market. Videographers will probably like this, as will wedding photographers, event and social photographers and photo journalists. I'm sure that it will be an excellent camera, but are we seeing the start of a distinct splitting of product lines? Are DSLR's from the Canon / Nikon axis now being seen as becoming professional / advanced / specialist tools only and that the 5D MkII's across the board appeal is now being seen as not possible at this moment in time? 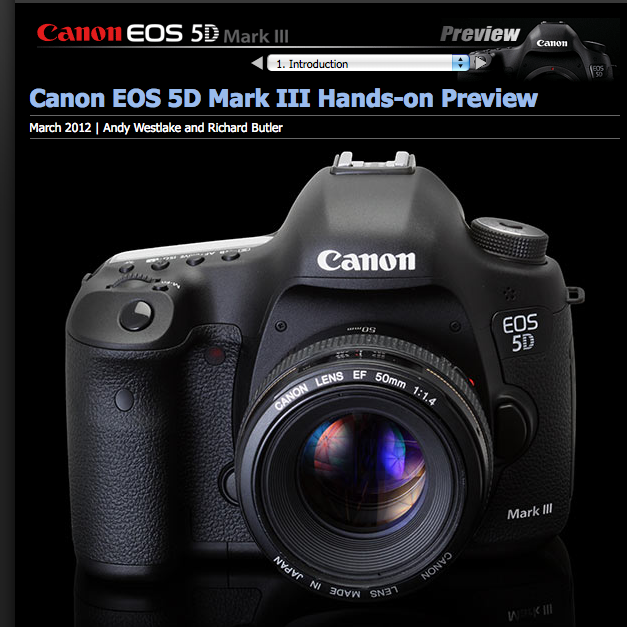 I pre-ordered a 5D MkII the moment it was announced, but the MkIII is just another camera as far as I'm concerned, and an expensive one at that. True I'm doing slightly different things these days, but I've bought 3 5d's, a 5D Mk II and a 7D in the past. All decent, if heavy and bulky cameras, and at a price that I didn't really think too long about. £3000 is a pretty high starting amount, and if I was still interested in this type of camera, that would make me think very seriously about what it offered me.